The webinar is part of a work-programme of the Integrating Agriculture in National Adaptation Plans (NAP-Ag) Programme, a joint effort led by the United Nations Development Programme (UNDP) and the Food and Agriculture Organization of the United Nations (FAO) to support countries to integrate and address climate change concerns as they affect agricultural sector-based livelihoods in national and sectoral planning and budgeting processes. Presentations & recordings now available. 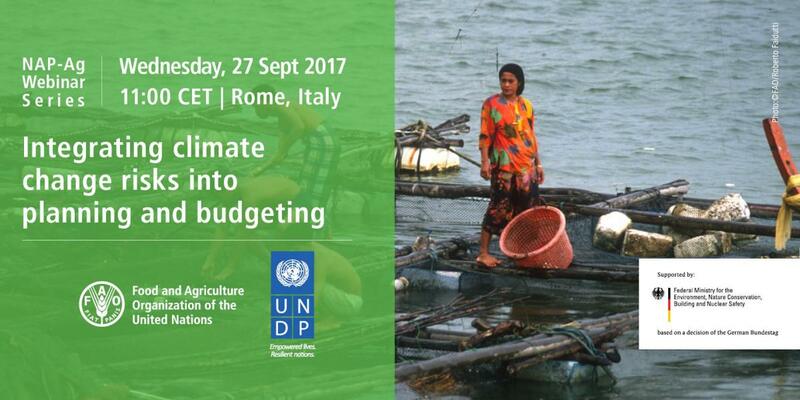 The NAP-Ag Webinar on Integrating Climate Change Risks into Planning and Budgeting provided an overview of how climate change adaptation can be integrated into national planning and budgeting, with particular reference to the agriculture sectors (crops and livestock, forestry, fisheries and aquacultures). Presenters shared country experiences in climate change planning and budgeting and introduced tools and approaches available for climate change budgeting and tracking. This webinar is part of the NAP-Ag programme’s ongoing e-learning initiatives that will include an upcoming Massive Open Online Course on National Adaptation Plans: Building Climate Resilience in Agriculture. Bangladesh NAPA submitted in 2005 (updated 2009). Built on a large participatory exercise. Prioritised adaptation options were submitted to the LDC Fund. BCCSAP can be seen as a NAP as it is effectively a long-term mainstreaming exercise. Bangladesh is integrating climate change into its 5-year National Development Plans. A longer-term plan, Vision 2041, is under development by Planning Commission. Bangladesh wishes to graduate out of LDC bracket. Opportunity for integrating NAP. Recognise that everyone is learning: Tools need to evolve over time, and be able to integrate improvements in climate data & methodologies.